By 2020, U.S. domestic travel spending will reach one trillion dollars, compared to just 400 billion in 2002. Domestic travel is a rapidly growing industry and for good reason: the United States offers some of the most diverse landscapes in the world, from stunning beaches and old mountain towns to vast metropolitan cities and dry deserts. There is no better time than now to start planning your next vacation! 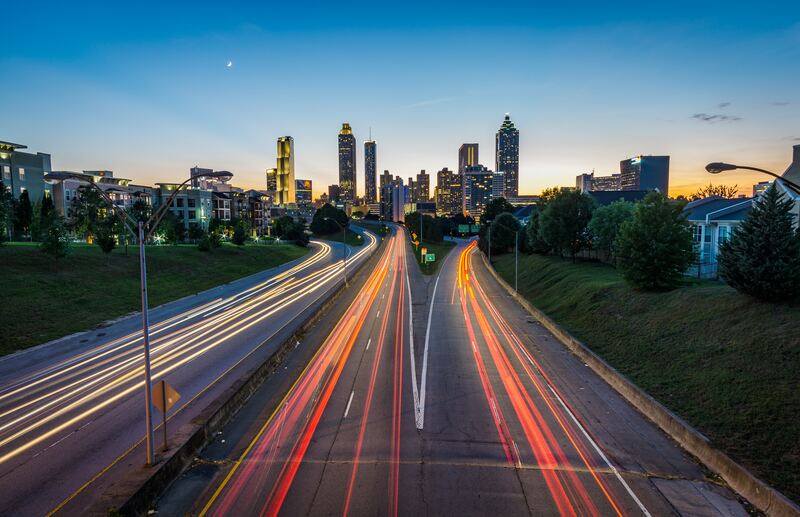 With its southern charm and modern vibes, laid back attitude and electric atmosphere, Atlanta will enchant you. There’s an elegance to this city, not only in its architecture and style, but at its core. Perhaps it stems from its history, from homesteads and plantations and the Civil War, to Martin Luther King, Jr. and other human rights pioneers. It is the Jewel of the South. The Big A is known for its hip hop scene, peaches, good universities and incredible outdoors, apart from its history, of course. Come here to cycle or to dance, to kayak or to eat, all while immersing yourself in some of the United States’ richest history! Big Sur is a nature lover's dream come true. The roughly 90-mile-long stretch of redwood and fog-trimmed waterfront between Carmel-by-the-Sea and Hearst Castle in California has no specific boundaries and no urban core. The area draws you in with a magical allure that is almost conspicuous. The classic drive through Big Sur, along twisting Highway 1, offers plenty of pullovers at places like the awe-inspiring Bixby Bridge. Stop at parks along the coastline and look up to see endangered California condors, North America’s largest birds, or look down to scan the swells for migrating whales or sea otters floating among dense beds of kelp, California’s signature seaweed. Santa Fe feels worlds away. Mystical, enchanting, colorful and inviting, this little city is sure to steal a piece of your heart. The fascinating history and palpable energy of the region is bound to captivate and inspire you, while the scenic backdrop of towering mountains and swaying plains create the perfect scenery for a relaxing and rejuvenating stay. Spend the mornings wandering adobe neighborhoods, popping into world class art galleries, visiting countless museums, and marveling at beautiful churches. For lunch, glide into one of the many world-class restaurants that dot the streets. When it comes to food in Santa Fe, one thing is for sure: no matter whether you choose an uninspired hole in the wall, or a fine dining establishment, your taste buds are in for a treat. In the late afternoon, nature enthusiasts can head out into the countryside for a tranquil grassy walk, a heart-pounding hike, or an exhilarating bike ride. Alternatively, for the more culturally inclined, make your way to one of the several remaining Native American “pueblos” that surround the city to learn more about the American Indian culture, customs and history. In this dreamy city, beautiful architecture and stunning art is interlaced by an absorbing history, deep cultural roots, pristine natural surroundings, and a distinctive sense of mysticism not found anywhere else in the USA. Death Valley is a destination of extremes. It holds the record for the hottest temperature ever recorded in the United States (134°F/57°C), and has the lowest point in the U.S. at 282 feet (86 meters) below sea level. With these extremes comes sheer beauty. The formidable desert landscape offers endless opportunities to explore. From rolling sand dunes to otherworldly rock formations and salt flats, the massive national park, which takes the second spot on the list of largest national parks in the U.S., is an adventurer’s ideal playground. Hop in a car and drive; around every turn you will find something unimaginable. From the Devil’s Golf Course, to the Artist’s Drive, no part of this huge park is like any other. While it’s recommended to get out of your car and do a few short hikes, it’s not necessary, and you can simply cruise around and experience the park and all of its glory from the comfort of your vehicle. Spend a day or two here on your next California road trip; you will not be disappointed. Sedona, Arizona may as well be Mecca for New Age spiritual practitioners. It’s beautiful here, with red, sun-stained rocks and barren cliffs pressed against the empty, desert sky. If the stunning scenery isn’t enough to induce spiritual reflection, don’t worry… Sedona is also home to four “vortexes,” or eddies of metaphysical energy flowing through the cliff sides and mesas. Many claim Native Americans used these mesas for rituals. Nowadays, you can find mediators and yoga lovers among the cliffs trying to harness this purported energy. The town bursts with mindfulness and yoga classes, crystal shops, and psychics -- truly a New Age haven. Even those skeptical about Sedona’s offerings must concede two things: the landscape is breathtaking, and the positive energy is contagious. Idaho Springs is known in Colorado as a great getaway from the hustle and bustle of Denver. It is a city famous for its mining history, where there are plenty of museums and even hands-on opportunities to participate in mining experiences. It is also a great base for outdoor enthusiasts, given its close proximity to stunning nature. Enjoy hiking, camping, paragliding, rafting, and swimming in the summer, and skiing, snowboarding, snowmobiling, and ice-skating in the winter. This is truly a year round destination filled with spectacular nature and history. With a motto like “Keep Portland Weird,” it’s clear that a trip to Portland won’t leave you disappointed. While the City of Roses is often overlooked in favor of its big sister, Seattle, up north, this is a thriving major city, which has managed to keep its small-town feel. Portland sits perched on the Columbia River, and has Mount Hood, the wild Oregon coast, and pristine winelands at its doorstep. Aside from the infinite nature adventures nearby, the city of Portland overflows with alternative cafes, eccentric microbreweries, and eclectic shops. This eco-city boasts an impressive public transportation system, making it easy to spend your days exploring its vibrant downtown, Japanese Garden, and thriving music and arts scene. Unlike any other city in Texas, Austin boasts an energetic nightlife, top-notch music, unfounded craft beer and food, and impressive art. It is sometimes called the “Live Music Capital of the World,” known for its two colossal music festivals every year, South by Southwest (SXSW) and Austin City Limits (ACL); indeed, it’s impossible not to stumble upon a bar or restaurant with live music every night of the week. Although known as the “Food Truck Capital of the World,” it doesn’t take itself too seriously. From a rundown food truck with four flat tires and a cracked windshield, you will get the best taco you’ve ever had. Next to it, an old Volkswagen bus will serve you delicious Italian-style gelato, all the while sipping a one-off craft beer from a local brewery around the corner. You can’t visit the home of the Longhorns without seeing the Texas Capitol Building, exploring the graffiti park with a can of spray-paint in hand, picnicking in Zilker Park, or eating some of Austin’s world famous barbecue. At the heart of the city’s nightlife is 6th street, a five-block stretch that takes a close second place to Bourbon Street in terms of liveliest party streets in the U.S.
Austin is quirky, lively, accepting, and uniquely itself. There is undoubtedly something for everyone in this eccentric metropolis. Kauai, known as “the Garden Isle”, is one of the volcanic islands that make up Hawaii’s archipelago. The landscapes here are full of tropical rainforests, lush mountainsides, and postcard perfect beaches, making it one of the most naturally beautiful destinations on the planet. Although Hawaii may seem like your typical tourist destination, the reality of Kauai couldn’t be more different. A handful of Kauai’s most dramatic landscapes, including sheer cliff sides and thundering waterfalls, can only be reached by sea or air, making many of this island’s top sights a true privilege to discover. Venture through the 16 km Waimea Canyon, trek to the top of Sleeping Giant Trail, follow the Kalalau Trail to an unreal beachside campsite, or dive in the turquoise waters of Poipu Beach. While its remarkable array of exciting outdoor activities are truly impressive, it’s Kauai’s inviting locals, laid-back vibes, and time honored traditions that really make this island the captivating destination that it is. Located 50 kilometers off the coast of mainland Alaska, Kodiak Island is an untouched natural paradise. The island is most famous for its lavish flora and fauna, and volcanic eruptions have, in the past, covered the entire island in ash, which has ultimately resulted in lush greenery and highly fertile soil. Famous not only for Grizzly bears, but also as one of the main salmon fishing areas in Alaska, Kodiak Island is a vital hub for income in the fishery industry. Often overlooked, Kodiak Island is the second largest North American Island after Hawaii's big island. Most of Kodiak is categorized as uphill country, with peaks reaching up to 1500 meters. The valleys are covered with glacier gravel and volcanic rocks, making for stunning scenery in the summer as well as in the winter. Culebra is nothing short of the ideal beach getaway. This secluded island paradise doesn’t boast the large resorts, shopping, or crowds that other more touristy beach destinations have. Culebra is perfect for a quick weekend trip or a longer vacation, but get ready to be adventurous, camping is huge here. Other lodgings are slowly popping up around the secluded island, but don’t expect anything luxurious . Regardless of how long you stay, get ready to spend most of your time on the world-class white sand beaches and snorkeling or diving in the crystal clear, blue water. One of the best ways to see the island is by kayak. Rentals are sparse outside of the main towns, but well worth the adventure. This is one of those places that you should visit now, because in a few years, the unspoiled beaches won’t be so empty anymore as tourists begin to realize how beautiful it truly is. Plan your next domestic trip to Culebra, you won’t regret it. The 350 miles (560km) drive is beautiful year-round, and perfect for the adventurer on any budget. The North Coast offers a more beach town/resort feel, while the Southern Coast feels more secluded with opportunities to camp and find a hidden spots away from the crowds. There are many activities to do along the highway; from wine, food, and coffee tastings, to hikes, whale watching, or simply taking in the stunning sites. The Oregon Coast is perfect for couples, families, or the adventurous solo road-tripper. Arguably the most beautiful coast in the U.S., soft sand dune beaches and jutting rock formations are abundant, offering a stunning contrast to the lush Oregon forests just off the coast. It’s difficult to drive more than a few miles without seeing remarkable cliffside beaches. Drive a few miles from the coast and hilly farmland provides a welcome escape from the rugged coast. Wineries of all sizes pop up around every corner, with some of the best views and wine in the world, making it hard not to stop. If you're searching for your next domestic road trip, the Oregon Coast just might be the right place for you. Appealing to the adventurer or resort goer, there is something for everyone to enjoy. While the name is descriptive of the hilly area in South, Central and West Texas, it doesn’t even come close to describing the sheer beauty of the area. From southern comfort and culture, to beautiful landscapes, this stunning area of the Lonestar State is definitely worth a visit. Stop in San Antonio for some historical and cultural immersion, then drive just a few hours northwest to Garner State Park for some hiking and kayaking. Enjoy the southern hospitality with some barbecue and craft beer at any one of the many world-renowned barbecue spots in Austin. Drive a few hours and visit any one of the unique Hill Country wineries. Stop at Gruene Hall to pay homage to country music legends like George Strait and Willie Nelson. The Hill Country is essentially an everlasting rodeo. It is impossible not to find something for everyone to see, do, and eat. Perfect for a few day getaway or a two week long vacation, you’ll be surprised by what you find in one of the most exciting parts of the south. Assateague Island is the epitome of a diamond in the rough. Perfect for a quick overnight camping trip, away from the hustle and bustle of the city, or for a longer stay, Assateague has something for everyone. Protected by three different wildlife agencies, this small island smack dab in the middle of the East Coast is nothing short of a pristine outdoor paradise. Whether you want to relax on the beach, meet the local horses, or hop in the water for a quick snorkel, you will not run out of adventurous things to do. Escape the small crowds and head for the western bay and spend some time in the calm, warm waters in a kayak, or diving for your dinner of clams and crabs. You won't have the authentic Assateague Island experience unless you camp in the National Park Campground, but plan ahead, it fills up fast in the summer. Although the name doesn’t give it away, the Great Sand Dunes are more than just sand and dunes. It is definitely worth renting or bringing a sandboard or sled. There are no designated trails in the dunes, so you can explore, wander, and sandboard as you please, but make sure you bring some comfortable shoes. Walking up hill in the sand is strenuous and difficult, especially with a large wooden board. A strong sense of direction is recommended too, as it’s easy to get turned around in the dunes. After an afternoon in the sand, take a quick trip to Medano Creek to cool off. If you have a 4WD car, driving deep into the park on the Medano Primitive Road is highly recommended due to the remoteness and seclusion. Lastly, you must stay to witness the sunset and starry night in the Great Sand Dunes - they are unlike anything else you’ve seen. As a bonus, you can hike to Zapata Falls, just outside of the park. It’s about 5 miles from the entrance of the park and the trailhead begins 3 miles up a rough road (4WD required), but it is well worth the hike to the stunning 30-foot falls. Amangiri is a remote hideaway tucked within the luminous canyons of the American Southwest. Located in a protected valley in Canyon Point with sweeping views, this luxury 5-star resort offers both adrenaline-fueled adventure experiences and a peaceful retreat. The resort is at the heart of the Grand Circle and within easy reach of some of the continent’s most magnificent protected areas, including the Grand Canyon, Bryce Canyon, Zion National Park and Monument Valley. Amangiri’s 243 hectares (600 acres) and beyond reveal stark beauty as well as rich cultural heritage. Nestled neatly at the northern tip of Wisconsin in Lake Superior are some of the most breathtaking, wind-blow, and lush islands in the U.S. Not yet ruined by the influx of tourists, the Apostle Islands are well worth the visit. In the spring, fall and summer, companies offer boat and kayak trips around the islands. Hiking and exploring the ins and outs of the many caves on the islands is very popular. A few islands boast old Victorian-esque resorts, while others remain largely untouched, open for camping and exploration. Lake Superior, the largest of the Great Lakes, and third largest freshwater lake in the world, feels like an ocean, and is best explored by boat. These islands are just the gateway to a vast body of water waiting to be explored. A myriad of legends swirls around Devils Tower. The most prominent myth describes children fleeing from a bear to the top of the hill and praying. The Great Spirit then responds by lifting the hill to form this great tower, with the bear leaving claw marks as it slid down the side. Less crowded and more onerous than the surrounding islands, Orcas Island is truly a hidden gem. It’s the perfect weekend getaway for the adventurous couple or family looking for secluded camping, private lodgings, and isolated exploration. This mountainous and lush island offers everything from boating trips, kayaking, and beautiful diving, to waterfalls and mountainous hikes for all experience levels. The adventuring is unmatched, but the foodie won’t be disappointed either. Orcas Island boasts some of the best food in the Pacific Northwest, from fine dining to simple coffee shops and bakeries. This should definitely be at the top of your domestic travel list -- before the unspoiled island is recognized as the tourist hotspot it deserves to be.